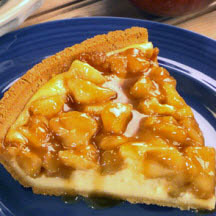 Combine delicious escalloped apples with the smoothness of sweet caramel for a wonderfully easy and delicious pie. Bake in preheated 375°F (190°C). oven for 40 to 45 minutes or until apple mixture bubbles up around edges of pie. Cool on wire rack. Serve at room temperature; promptly chill leftover pie. *Defrost frozen escalloped apples in microwave on 50% power for 6 to 7 minutes.